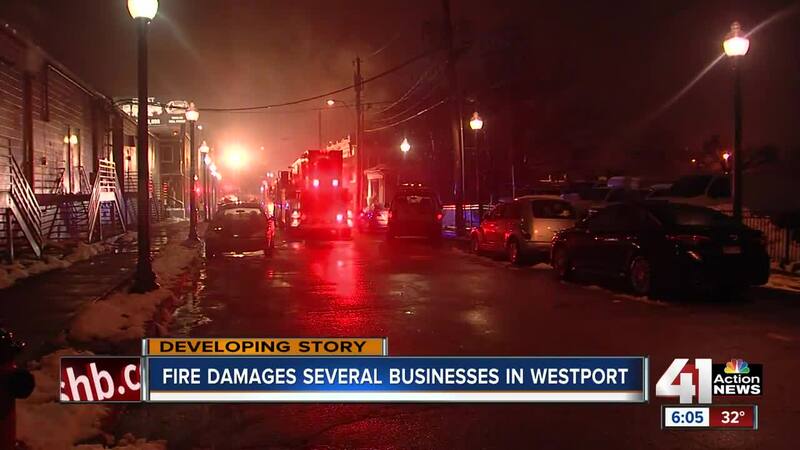 A fire tore through two stories of a building in Westport late Wednesday night. The Kansas City, Missouri fire department responded to 827 1/2 Roanoke Rd. at about 10:15 p.m. When firefighters arrived, they could see flames and smoke coming from both floors of the building. KANSAS CITY, Mo. — A fire tore through two stories of a building in Westport late Wednesday night. The Kansas City, Missouri fire department responded to 827 1/2 Roanoke Rd. at about 10:15 p.m. When firefighters arrived, they could see flames and smoke coming from both floors of the building. A bystander, Chapman Williams, recorded the flames with his cellphone. The fire department said no one appeared to be injured in the fire. The department has not released any information about a possible cause. Flames destroyed a pickup truck and tore a hole in the back of the building which is about two doors west of the popular Westport Flea Market restaurant. It appears the fire started in or above The Skin Studio, a skin care and waxing clinic. A law firm is listed on the door to the building. The fire may have also damaged the adjoining building which houses 825 Studios, a video production and photography business. That company said on Facebook that it expects to be re-open at a new location within the next two weeks. According to 311 data from Kansas City, someone complained about people living in the neighboring building at 825 Westport Road in April 2018. The city ruled no violation occurred. It's unknown if anyone was living in the building when the fire started Wednesday night.